I urge everyone to start their week right by reading this truly great essay by Pulitzer Prize-winning architecture critic Inga Saffron in today’s Philadelphia Inquirer. NOBODY predicted what happened in Philly over the last three days, while a chunk of the city was closed to cars and buses to provide security for Pope Francis. What happened was that the fifth largest city in America got to experience a piece of itself as a car-free zone, just as many European cities enjoy parts of themselves–welcoming of pedestrians, bicyclists, dogs, children enjoying more freedom than usual–and sporting a totally different vibe. 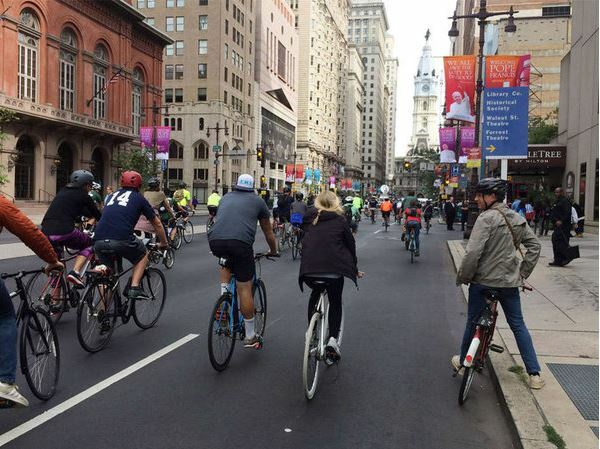 My daughter is a Philadelphia teacher who lives in the city without a car and bikes everywhere she goes. The schools were off Friday and today and it was a great time to be in Philly! « Jersey, the Peach State?